Another season of Atlantic 10 basketball has come to a close following VCU and Saint Louis’ losses this past Friday night. What does that mean? We get to enjoy the rest of March Madness rooting on our brackets but not our teams. But it also means we have a long offseason ahead of us where a lot can happen. For starters, George Washington has already hired a new head coach after relieving Maurice Joseph of his duties at the helm. Matt McCall at Massachusetts has gotten rid of some assistant coaches while players transfer, and Saint Joseph’s quickly found a new head coach after the surprising firing of Phil Martelli last week. It’s only been less than 2 weeks since the close of the Atlantic 10 Tournament, so expect these initial prognostications to be wildly different than what they may look like in November: we have a long offseason to endure potential transfers (both in and out of programs) as well as head coaching changes. But without further ado, let’s take a way-too-early look at the 2019-20 season. Note: I will try to make updates as offseason news rolls in. I’ve done a bit of a 180 on my preseason #1 pick after tweeting out initial power rankings a few weeks ago where I had Dayton atop the list. VCU returns all but 2.8 points per game (Michael Gilmore) and should be expected to take the league crown 2 years in a row. Despite a frustrating end to a very solid season, VCU should be more than happy to have gotten back to the big dance, and Marcus Evans’ health was certainly a question this past week; not to mention, an opening round NCAA Tournament loss to a very dangerous UCF team is nothing to be ashamed of. I’d peg Marcus Evans as an early favorite to win Atlantic 10 Player of the Year in his senior season, likely duking it out with Jon Axel Gudmundsson — the winner of the title this year. 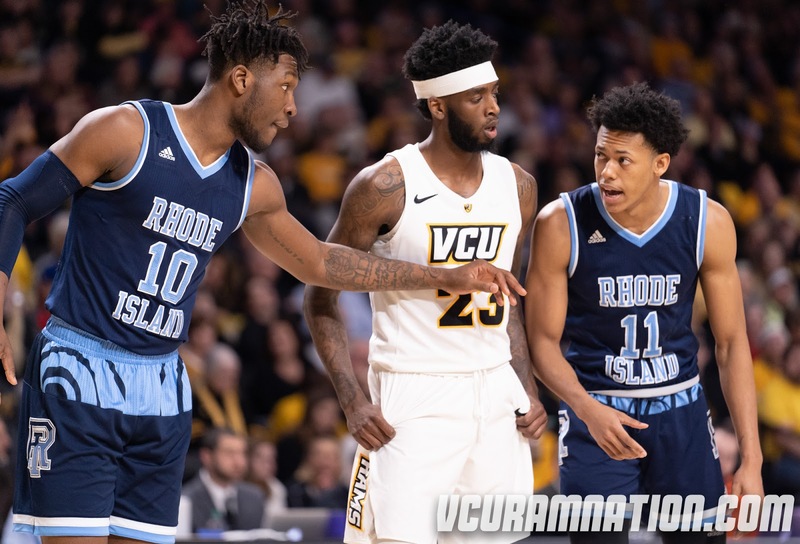 VCU’s defense was what made the Rams elite during conference play, but if they want to see the 2nd weekend in the NCAA Tournament, the Rams will need some improvements on the other end of the floor. Evans shot just 27.3% from deep this year, a metric that can certainly be improved this offseason. As a team, VCU was barely 30% from long range, and they shot just 6/26 from three against UCF. In my opinion, VCU was a bit too reliant on the three as a team without a truly lethal outside shooter. Marcus Santos-Silva was arguably VCU’s most dominant player in the closing weeks of the season, and I’d look to his improvements inside as an indicator of the Rams’ success. Barring some crazy roster turnover (which is highly unlikely given VCU’s success this year), the Rams will be a deep, experienced team yet again and the favorites to win. Not much significant news has come from VCU this offseason, which is a good thing. Sean Mobley announced his intentions to transfer (4.2 PPG), which is a bummer for the Rams but certainly isn’t an enormous loss. As long as VCU keeps its strongest 4 contributors around for next season (Marcus Evans, Marcus Santos-Silva, Issac Vann, and De’Riante Jenkins), I see no reason why VCU shouldn’t be the favorite to win the Atlantic 10 in 2019-20. With the recent transfer announcement from Jordan Davis, I’ve dialed back my confidence in Dayton slightly, though I do expect the Flyers to be a top 3 team yet again. Dayton should (might?) return Obi Toppin, their star freshman who made first team All-Conference this season, though there have been NBA murmurs. We’ll have to wait and see. Jalen Crutcher, Ryan Mikesell, Trey Landers, and Dwayne Cohill will all be back. Those 5 returnees (assuming Toppin) could compete for an Atlantic 10 crown all by themselves. Luckily for the Flyers, it’s the new guys that have been generating all the buzz. Florida transfer Chase Johnson was a 4 star recruit out of high school, adding size to the Flyers’ frontcourt after the departure of Josh Cunningham. Speaking of size, Dayton adds a 6’11”, 270 pound Nebraska transfer in Jordy Tshimanga, a guy who was a key role player for the Cornhuskers in the 2017-18 season before transferring to UD. He and Obi Toppin would create a formidable frontcourt that would be difficult for any A-10 team to stop. Ibi Watson is a transfer from Michigan that a number of fans are excited about, and Rodney Chatman is a Chattanooga transfer who can shoot the three and will be a huge help in the absence of Davis. In terms of talent, Dayton should be at the top of the league, all things considered. Anthony Grant is going to need to coach these guys to the top of the league. If Obi Toppin is back next season, Dayton should be as likely as any to win the league crown. Though like we’ve seen at Massachusetts, just because you have an influx of transfers doesn’t mean you’re automatically going to win. This Dayton team has to make strides to get better in the offseason, but the Flyers could make it back to the Big Dance in 2020. I’ve still got Dayton ranked #2 in this update, though Obi Toppin announced his intention to enter the 2019 NBA Draft while keeping his eligibility. What does this mean? Obi is likely to test the waters and get an evaluation on where he stands. Based on what I’ve seen in NBA Draft Boards, I don’t think Toppin has much of a shot at getting drafted this year, but it’s still a good idea for him to get evaluated before deciding whether or not he wants to come back to Dayton. Toppin is expected to be UD’s best player next season, meaning his return is crucial for this #2 ranking to hold. With Obi Toppin, Dayton is likely an NCAA Tournament (or is at least on the bubble pre-season). Without Obi Toppin, I don’t think the Flyers will go dancing in 2020. I would be pretty surprised if Obi does not return next year, though. Though the season didn’t end how the Wildcats anticipated, Bob McKillop’s group should have a shot at the 2020 NCAA Tournament, and I’d give Davidson a pretty good chance at winning the league crown as well. A team that finished 2nd this year returns Jon Axel Gudmundsson, Kellan Grady, Luka Brajkovic, Luke Frampton, etc. Pretty much everyone except Nathan Ekwu comes back, and I believe Dusan Kovacevic will be transferring for his last year of eligibility. Regardless, this will be the final season for A-10 POY Jon Axel Gudmundsson, and it’s clear that this is his team. JAG proved to be a playmaker and the Wildcats’ go-to-scorer in 2018-19, and I can’t anticipate anything changing in that regard. The Wildcats will need a big offseason from Luka Brajkovic who has shown so much promise in just one season under Bob McKillop. 6’10” freshman forward David Kristensen adds some size for next season, but Luka’s traditional post play opened up a lot of options for Davidson on the perimeter, and post depth was somewhat of an issue when Brajkovic had to go to the bench. If he can continue to improve as a scorer and passer, I have to image this Davidson team finds a way to go dancing in 2020. Not to mention, a fully healthy Kellan Grady is something we lacked for a majority of the 2018-19 season — that won’t be the case next year. Bob McKillop has a great season ahead of him. I’m not changing this ranking either, as I think Davidson is still looking at a good chance at an NCAA Tournament berth in 2020 and an even better shot at finishing top 3. Kellan Grady and Jon Axel Gudmundsson also announced their intentions to enter the NBA Draft this year, but like Obi Toppin, I expect both to return to Davidson for their respective junior and senior years. Obviously, this 3rd place ranking is assuming both come back, and with two reigning A-10 All-Conference players on the roster, Davidson will have as good of a shot as any at winning the league. Maybe it’s Mark Schmidt. Maybe it’s something in the water up in Olean. Whatever it is, you can’t count out the Bonnies. St. Bonaventure was 20 minutes from a trip to the NCAA Tournament this year despite graduating Jaylen Adams and Matt Mobley the prior season. Thanks to 3 incredible freshmen — Kyle Lofton, Osun Osunniyi, and Dom Welch — the Bonnies made a run in the A-10 Tournament after somehow grabbing the double-bye. Those 3 are coming back, and that trio is not going to be fun to face. Osunniyi has established himself as an elite defender and is already developing an array of post moves (not to mention his ability to play above the rim). Kyle Lofton is one of those “does it all” guards who could erupt and average 20+ points per game as a sophomore. Meanwhile, Dom Welch really proved himself to be a dangerous shooter in Brooklyn. Jaylen Poyser and Amadi Ikpeze should both be back as well. Though Courtney Stockard and Ladarien Griffin will be major offseason losses, the Bonnies should reload. Justin Winston is a 3 star power forward from New Jersey, and he comes from the same prep school as Lofton and Osunniyi, so the Bonnies better hope history is any indication… JUCO shooting guard Matt Johnson gets added to the roster as well, but after the recent transfers of Tshiefu Ngalakulondi and Melkisedek Moreaux, Marck Schmidt still has a lot of spots to fill. If St. Bonaventure can add a few more weapons before November, you better watch out. I’m not going to move the Bonnies in my preseason rankings either; I think they’re still in great shape to finish top 5. St. Bonaventure still has quite a few spots to fill before the start of the 2019-20 season, so look for the Bonnies to add an impact transfer or two, something that could help this team’s stock even more. Finishing top 4 is going to depend on Kyle Lofton, Osun Osunniyi, and Dom Welch; barring some odd roster turnover this offseason, all 3 should be back. Oh, and Mark Schmidt is a wizard. There should be an asterisk next to this 5th place ranking for the Dukes, because this is not an attempt to undermine them. I think Duquesne has the talent to compete for an NCAA Tournament bid next season, though given how strong the league is top-to-bottom, I think the Dukes still might be a year away from making a run at the league crown. That said, everyone is back for the Dukes. Sincere Carry, Tavian Dunn-Martin, Eric Williams Jr., Michael Hughes, and many more, will be juniors and sophomores next season — again, this is a big reason why I think 2020-21 is going to be Duquesne’s year. We saw the Dukes finish with 19 wins, its most since 2011. Duquesne lost 4 of its last 5 but played a decent portion of the end of the season without star point guard Sincere Carry. Duquesne was a bunch of comeback kids this year, as no deficit was insurmountable under Keith Dambrot. The Dukes’ head coach will be going on his third year, and he had a great quote in the press conference following a loss to Saint Joseph’s in Brooklyn. Dambrot stressed that his team needs to get better defensively, and just because his guys are young doesn’t mean they’ll get better unless they work for it. Keep in mind, this 5th place ranking is pretty variable at this point, and I think Duquesne could be a sneaky top 3 team in 2019-20. Now that all the pieces have had a season playing with one another, this offseason will be crucial for improvement. I’m dropping Duquesne from 5th to 6th in my rankings due to the transfer of Eric Williams Jr. That’s a huge loss that’s going to sting for Keith Dambrot’s club. Duquesne also loses Gavin Bizeau, Dylan Swingle, and Brandon Wade to the transfer portal. It’s likely that some of these guys see themselves in a bigger role at another school, as Duquesne’s roster runs pretty deep. I think the Dukes could be 1 year away from making the NCAA Tournament (meaning they could be in contention in 2021). I just don’t see it happening without Eric Williams Jr. Look for this to be another growth year as guys like Sincere Carry, Tavian Dunn-Martin, and Michael Hughes take over as the leaders of the team. I was incredibly impressed with the way Rhode Island finished the season, and I think that’s a window into the future for David Cox’s club. The Rams, who beat VCU twice this past season, bring back almost everyone (a theme among most A-10 schools this year). Jeff Dowtin, Cyril Langevine, and Christion Thompson will all be seniors. Langevine was unfairly left off the first team All-Conference this season, and he’ll surely have something to prove as one of the toughest big men in the conference. Fatts Russell returns as well, and promising rising sophomores Tyrese Martin, Dana Tate, and Jermaine Harris seem to be a strong foundation for the future. Georgetown transfer Antwan Walker should add some athleticism for Rhode Island, and 3 star freshmen Mekhi Long and Gregory Hammond will be nice additions as well. We honestly saw Jeff Dowtin and Fatts Russell go through some rough stretches this season, but both really started playing better toward the end of the season. In particular, Russell seemed to break out of his sophomore slump with a 41 point night against Saint Joseph’s followed by 27 against Massachusetts. Let’s hope Russell carries that momentum into his junior season. Cyril Langevine will be the breadwinner once again, and his contributions to the team will be most vital. In a league where teams are starting to load up on big men, you’d be hard-pressed to find one more capable than Langevine. Rhode Island is getting a bump to #5 with Duquesne’s loss of Eric Williams Jr., and thanks to the way the Rams finished the season, they’re outlook for 2019-20 is pretty positive. I talked about this team having some early non-conference opportunities in my early season tournaments article. If the Rams are able to pull off a big win in November over a team like Utah St., you might have to put them on watch for making the NCAA Tournament in 2020. It certainly could happen with this roster. Had Travis Ford not willed his team to the NCAA Tournament this year, rattling off 4 straight wins in Brooklyn, I don’t think I’d believe in this team much heading into 2019-20. However, the Billikens will lose Javon Bess, Tramaine Isabell, Dion Wiley, and D.J. Foreman, and that’s tough to come back from immediately. Jordan Goodwin and Hasahn French will be Saint Louis’ two key returnees, and the former is going to have to be Saint Louis’ main scoring option with Bess graduating this spring. Luckily for Saint Louis, the future is bright with a loaded class of freshman: Yuri Collins, Gibson Jimerson, Terrence Hargrove Jr., and Jimmy Bell Jr. are all highly-touted recruits that will have a chance to prove themselves in their first years. Expect Ford to experience with a number of lineups and give his freshmen a lot of experience, as they’ll become the foundation for this program. Saint Louis is going to rebuild and be a strong team in the future; however, it’s going to take some time after graduating four elite seniors. This feels like somewhat of a make-or-break season for Dave Paulsen, as 2018-19 was kind of a letdown, all things considered. George Mason only graduates Otis Livingston II this offseason, but Jaire Grayer is also leaving as a grad transfer, and although both were very crucial players for the Patriots, a new star has emerged in Justin Kier. Kier will be surrounded by Ian Boyd, Jarred Reuter, Javon Greene, Goanar Mar, and many more in his senior season, but he’ll be the one doing the heavy lifting for Mason. Freshmen were the main storyline in 2018-19, in my opinion. Jordan Miller emerged halfway through the regular season and became one of the best players on the court for George Mason in a year where he was expected to redshirt. Jamal Hartwell II is also a name worth mentioning, as the freshman began seeing a lot more time on the court in March and put up a few big performances. It might take some rebuilding to get George Mason back to the top of the conference, but again, this kind of feels like a make-or-break season. If the Patriots don’t finish in the top 8 or 9, Dave Paulsen’s seat will be warm. We got some offseason news that Jarred Reuter will be leaving the Patriots, and even though he wasn’t the transfer Mason fans hoped he would be, that’s beginning to leave GMU’s frontcourt incredibly thin. I’m bumping down George Mason to #9, as I’m not too sure about next season. The Patriots have Justin Kier coming back, and it looks like they’ll go as far as he’s willing to take them, but outside of Greg Calixte, I’m not sure who’s going to provide quality minutes in the post. I could see GMU getting thrashed on the inside next season, as the A-10 has some great bigs across the league. Honestly, if Chris Mooney gets his act together, he could have a really good team in 2019-20; however, I said the exact same thing last April, and then a bunch of guys left the program. I don’t know what to expect, so I’m throwing Richmond in the 9 spot. Grant Golden, Jacob Gilyard, and returning Nick Sherod could honestly be the best trio of players in the league next season, which is why this UR team is such a wildcard. The Spiders could honestly compete for the top 5 if those 3 stay healthy and the role players continue to develop. Nathan Cayo had a very impressive sophomore season and looks ready to take the next step. Freshmen Jake Wojcik and Andre Gustavson seem to be on the right trajectory as well. There is no reason this Richmond team shouldn’t be really good next year with all of this talent. Obviously a good portion of the fanbase has been discontent with coach Mooney, and that’s understandable. I will give Mooney the benefit of the doubt this past year, missing Nick Sherod for the entire season. If all of these guys are back and Chris Mooney can’t finish top 6 in the A-10, I can’t imagine justifying his return. This is going to be an interesting program to follow in the coming season. All things considered, I hope Mooney and co. prove me wrong, and this Spiders team bounces back in a big way. Richmond is getting a bump to 8 here, and this is partially because I think I was a bit too conservative the first time around. We haven’t heard of any major transfers out of the program yet, so that’s big news. Because realistically, if you have a roster of Jacob Gilyard, Grant Golden, Nick Sherod, and Nathan Cayo coming back, there’s no reason you shouldn’t finish at least 8. Don’t hate me Fire Mooney Mafia, but I think this is the year Chris Mooney comes through and delivers a truly solid season. I think 8th in the Atlantic 10 still might be a bit conservative. We’ll see as we get closer. La Salle would be up higher in these rankings were it not for Jamir Moultrie and Traci Carter announcing their intentions to transfer this offseason. With the graduation of Pookie Powell as well, La Salle is left with a pretty thin backcourt in which incoming freshman Ayinde Hikim could be seeing a lot of time at point. The Explorers keep Saul Phiri, Isiah Deas, and David Beatty who should all be solid scorers. Prolific offensive rebounder Ed Croswell will be back, and La Salle adds some nice newcomers as well. The Explorers should make steps in the right direction in 2019-20, but by no means will this team be competing for a league crown. I like the way Ashley Howard turned around this team after an 0-10 start, and I think November and December will be a bit less rocky for him next year. I don’t love ranking La Salle this low, but I don’t know who I’d justify bumping. Ashley Howard still has 3 open spots to fill, so I think we’ll get a better picture of this team’s outlook once the transfer portal begins to settle down. The Explorers could greatly benefit from adding a grad transfer point guard, as they lost both Jamir Moultrie and Traci Carter. Other than that, I think the Explorers have enough pieces to run a solid rotation in 2019-20. La Salle should be better overall, but so will the league. Philadelphia 76ers assistant coach Billy Lange is set to take over as head coach, and this has been a tumultuous offseason for the Hawks’ fanbase in general. SJU sent Phil Martelli packing in what was a surprise for almost anyone who follows the league. Lange was hired quickly, and though he certainly seems like an adequate coach who’s capable of leading this program, a lot of fans were hoping Jameer Nelson would step in; after SJU decided to go another route, Nelson announced that his son (who had been committed to SJU for the class of 2020) will be reopening his decision. That’s not good. There are a lot of emotions involved right now; some fans are happy Martelli is gone, some are furious, and some are just confused. I’m not sure what to make of Saint Joseph’s this early in the offseason, as the Hawks still have roster spots to fill and will need to retain its returning players. Charlie Brown Jr. could try his luck in the NBA draft, and given what’s been going on, along with the general tendencies when a new coach is hired, I wouldn’t be surprised to see some roster turnover this offseason. I think Lange could do an excellent job at Saint Joseph’s, but 2019-20 is not going to be a great year. I hate doing this to Saint Joseph’s, but literally everyone is leaving, and I have no choice to drop the Hawks to 13th. Billy Lange is going to have a tough rebuilding year, and that’s just going to be a fact. Charlie Brown is leaving to go pro, and Lamarr Kimble, Tory Holston, Lorenzo Edwards, and Jared Bynum are all transferring. Who is left? The Hawks have 8 scholarships to fill. STOP THE BLEEDING! It’s hard to have much confidence in Massachusetts’ 2019-20 season right now. Luwane Pipkins, Tre’ Wood, Curtis Cobb, Kieran Hayward, and Unique McLean will all be transferring. Did I get everybody? Massachusetts also saw coach McCall relieve his assistant coaches of their duties which many saw as a strange move. The Minutemen are really starting anew as the prior list of players have intentions of transferring, and the college basketball season hasn’t even ended yet officially. There are some key remaining pieces for McCall to build a team around. Most notably, Carl Pierre will be the centerpiece for a thin roster, and offseason recruiting will be key moving forward. It’s going to take a few years for Massachusetts to get back on its feet, so no one should be expecting much next year. We’re giving Massachusetts a slight boost here thanks to the incoming freshman class that Matt McCall has managed to recruit. T.J. Weeks and Tre Mitchell are two very good recruits who could have a very bright future at UMass. We saw a lot of roster turnover at the end of the year, and that was kind of bound to happen, but if you’re a fan of the Minutemen, this will be a fun freshman class to follow. I probably would’ve put George Washington ahead of Massachusetts had Terry Nolan Jr. and Shandon Brown not decided to transfer, but here we are. This is a similar situation as the above paragraphs, but George Washington has a new coach, so the rebuild is kind of expected. Justin Mazzulla, D.J. Williams, and returning Arnaldo Toro will be 3 players to keep an eye on in 2019-20. If Jamion Christian can utilize those guys in his first year as head coach, he’ll be able to win some conference games. At this point, Christian needs to do his best to keep the current roster around and begin recruiting a new base. It’s a new beginning for Colonial fans, and this has been a program that has endured a lot. It’s time GW gets back to winning basketball games, and I think Christian is a good coach to do just that, but 2019-20 will be tough. Jameer Nelson Jr., son of former Saint Joseph’s Hawk Jameer Nelson, has committed to the Colonials, which makes next year very interesting (at least when these 2 teams meet). GW does bring back a lot of talent, so I’m curious as to what Jamion Christian is able to do in his first season with the Colonials. I’m still not very high on this George Washington team, but they should improve nonetheless. Fordham may have a shot at avoiding the 14th place finish next year, but with Jeff Neubauer still leading the charge, I’m not too confident. Freshmen Nick Honor and Jalen Cobb are the future of this program, and I hope both can have solid sophomore seasons, as the Rams desperately need some momentum. I believe Prokop Slanina will be returning, adding much-needed size inside for Fordham. The Rams had some solid showings this past season, starting with a nice win over Rutgers and continuing with an OT road win over Rhode Island. However, this was a team with one of the worst effective field goal percentages in the nation; that is not a recipe for success in a league that will be much-improved next year. With Nick Honor announcing his intention to transfer from Fordham, the Rams lost the one piece of the puzzle that would give any justification to not ranking Fordham 14th. Thus, they remain 14th. Fordham’s inability to retain talent has been ludicrous, and Honor’s departure is yet another example. Love seeing VCU at #1. Lots of early top 25 polls have VCU in right now. Will be interesting to see if the Rams crack the Top 25 heading into the season. I’ve seen some rankings without VCU and some with them as high as 17-ish. My guess is between 20 and 25.